Free Printable St. Patrick’s Day Trivia Quiz. Free Printable St. Patrick’s Day Trivia Game to have fun in March at St.Patrick’s party or celebration. Let’s find out how much you know about the St. Patrick’s Day. Learn about the first parade, shamrock, pot of gold, Leprechaun, green color, stew, Irish rock bands, walking stick, shamrock, and more from the St. Patrick’s Day. The participant with most correct answers wins. The game includes 12 entertaining trivia questions and the answers sheet on page 2 (answers in bold). 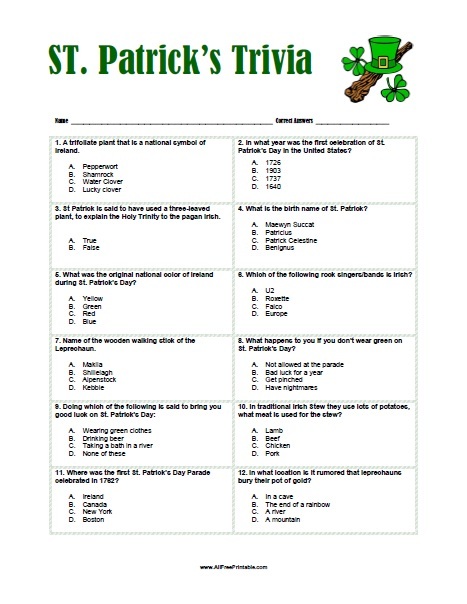 Click the link below to download or print the St. Patrick’s Day Trivia Game now in PDF format. Have fun at the St. Patrick’s Day Party with this free printable trivia quiz game! Cant print the St Patrick’s day trivia . tried 5 times. the word scramble printed just fine. I tested the trivia with my phone and when I clicked the print link it was downloaded. When I tested the link with my laptop it opened the PDF in a new tab. Please tell me if you still have problem printing the trivia.